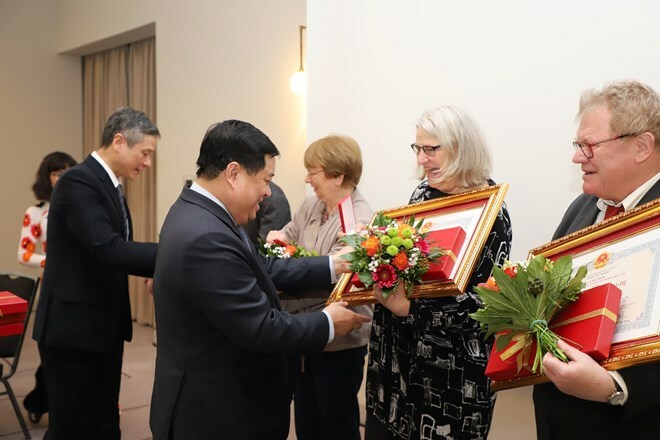 Berlin (VNA) – Minister of Planning and Investment and Chairman of the Vietnam – Germany Friendship Association Nguyen Chi Dung on March 17 presented gifts and Friendship Order of the Vietnamese State to German individuals and organisations who contributed to bilateral traditional friendship and cooperation. As part of his ongoing working visit to Germany at the invitation of the host Minister for Economic Affairs and Energy Peter Altmaier, the event attracted German friends and Vietnamese nationals living in Germany. Minister Dung said his visit aims to strengthen bilateral ties, especially in economy, trade and investment, and spoke highly of German friends’ support for Vietnamese people during the anti-US war in the past and national development at present, he said bilateral friendship and comprehensive partnership across economy, trade, culture, education and science have thrived. According to him, political trust, cultural similarities and achievements in coordination over the past four decades have created a strong driving force to lift bilateral ties to a greater height. He expressed his hope that Vietnam will receive further support from Germany in national construction and development.